"Luna di Luna Pinot Grigio is golden yellow in color with a bright, slightly spicy nose. The flavors are fresh and juicy with just a hint of spice. Dry, full and balanced flavors pleasantly linger on the palate. You can enjoy Luna di Luna Pinot Grigio as an aperitif, along with seafood, shellfish, soups and cheeses." "Pinot Grigio is now a popular and food-friendly wine around the world, but the Italians arguably still do the best job of transforming their native grape into a fascinating wine with finesse. Hillside fruit from the Tuscan Estate of gabbiano was slowly fermented to create a medium-bodied wine that captures a unique combination of fragrant almond and melon aromas with a crisp mouthfeel and nutty flavors interwoven with ripe pear juicy lemon. The long finish lingers with a fresh acidity." "Tasting notes: This dry white wine is pale straw-yellow in color. The clean, intense aroma and dry flavour with pleasant golden apple aftertaste make Santa Margherita Pinot Grigio a wine of great character and versatility. Culinary suggestions: Excellent as an aperitif, ideal accompaniment to seafood salads and fish- and shellfish-based pasta and rice courses. Perfect with white meats and boiled or grilled fish and with soufflés." "A zesty 100% Pinot Grigio from selected vineyards in Trentino-Alto Adige and Friuli. 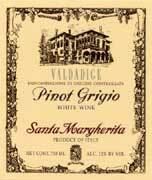 The grapes are harvested in late September and fermented in temperature-controlled stainless steel tanks in order to preserve the wholesome freshness and fruitiness of this tremendous Pinot Grigio. 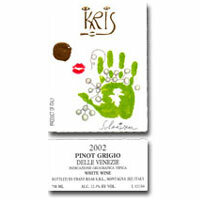 In its 2006 Restaurant Poll, Wine & Spirits named Kris “the second most popular Pinot Grigio in restaurants”, a remarkable achievement for this crisp, fruity, stylish and quintessential Italian wine. Pale yellow in color with brilliant greenish reflections, Kris offers enticing aromas of acacia flowers, citrus, tangerine, and hints of apricots and almonds. Clean and refreshing on the palate with hints of blossom and honey. Recommended with risotto, lightly flavored pastas, omelettes, quiches and grilled white meats or salmon." "The principal source of grapes for our Pinot Grigio is Trentino’s Adige River Valley. This area is ideal for vineyard cultivation due to its exceptional soil and climatic conditions, and is recognized for the spectacular natural beauty of the Dolomite Alps that form its backdrop. The grapes are carefully selected and then vinified utilizing the most advanced technology. Cold fermentation in state-of-the-art, thermo-conditioned tanks preserves the natural 100% Pinot Grigio fruit and inimitable freshness of the wine. 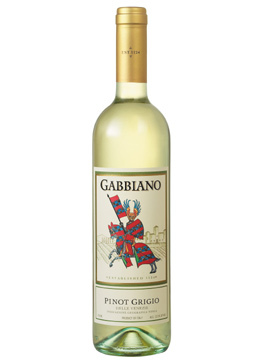 With its crisp, light character, bright straw gold color, and appealing fruit flavors and refreshing scents, it’s no wonder this is America's #1 Pinot Grigio. 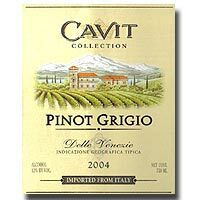 Dry, light and crisp, and highly versatile, Cavit Pinot Grigio is a wonderful apéritif and equally splendid with pasta in cream sauces, risottos, veal, chicken and fresh seafood dishes. Enjoy well chilled. " "The 2005 Bella Sera Pinot Grigio has a yellow-gold color and aromas of apple and lemon with pear overtones. The wine is medium-bodied with a clean, crisp palate and a light finish. Intense aromatics and good balance characterized this year’s vintage. Bella Sera Pinot Grigio is a perfect complement to grilled vegetables, light pastas, and seafood."